Home Blog The Best Natural Australian Skin Care Brands of 2017! It has been a huge year for skin care brands, with the world moving towards safer natural & organic products, we had to test them for ourselves! This is what we have found to be the best products on the market for price, availability & if they actually work! What began as a desperate effort by a father to cure his son’s eczema has become one of Australia’s most touching success stories. Grahams Natural was founded by Geoff Graham who after suffering a lifetime of eczema himself discovered that he had passed down the skin condition to his son, Ryan. Dissatisfied with the products on the market such as toxic steroid treatments, Geoff along with his wife Shannon, developed alternatives to Cortisone and prescriptions laden with potentially dangerous side effects such as: thinning of the skin and bones. The pair spent years researching and sampling their own mixtures of all-natural, raw materials and until finally they formulated a natural eczema treatment. 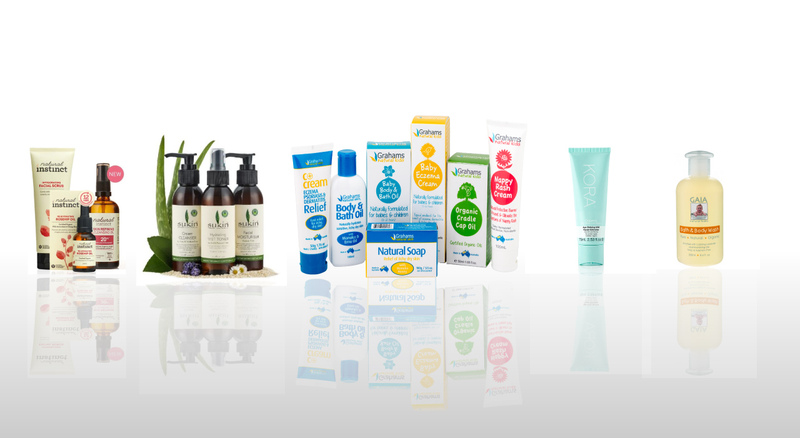 Grahams Natural sets the highest of standards as they manufacture in Australia a complete line of approved skin care solutions for people with conditions such as: Eczema, Psoriasis, Rosacea & Dermatitis. The success of their creams and ointments which relieves itching, redness of the skin while helping skin repair and has led to a series of other wildly successful products that have helped not only Geoff and his son Ryan, but countless others who suffered from skin disorders worldwide. Check out the full story here. KORA Organics was born after its founder, Australian supermodel Miranda Kerr, struggled to find effective organic skin care products in the beauty market that fitted in with her healthy, organic lifestyle. Today, the brand has over 20 certified organic face and body products, all of which contain a variety of natural ingredients – including Miranda’s fave noni (it’s a fruit) – to help nourish, replenish and hydrate the skin. One look at 33-year-old Miranda’s glowing, youthful skin and you know KORA Organics truly does feed the skin with natural ingredients that leave it radiant and revitalised. Founded in Melbourne by brother and sister duo Simon O’Connor and Alison Goodger, Sukin is one of Australia’s favourite natural skin care brands thanks to its low price points, natural, vegan and cruelty-free formulations, and earth-friendly ethos. All its efficacious products are created using high quality botanical extracts and essential oils, and treat a number of skin issues and concerns. The brand’s favourite skin-loving ingredients include rosehip oil, kale, spirulina, argan oil, acai and goji berry, just to name a few. With over a decade of experience in bringing natural skin care and haircare products to Australians, Natural Instinct is all about delivering formulations that work, proving that you don’t need to compromise on efficacy for natural ingredients. The brand is so set on delivering products of the highest quality, they’ve created their own Natural Ingredients Standard, unique authenticity standard for crafting truly natural plant derived products that are free from sulphates, parabens, artificial colours and fragrances, silicones, and so much more, as well contain EcoCert-approved ingredients. Previous articleThe Best Anti Dandruff Shampoo? Next articleNatural Coconut Oil for every skin type?